Robert Weiss focuses his practice on a variety of hedge fund, fund-of-funds and corporate-related matters. 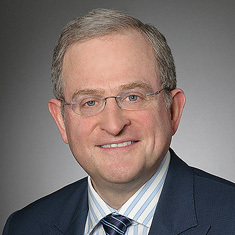 He regularly advises banks, financial institutions and investment funds with respect to hedge fund and other lending and leverage transactions, including those involving total return swaps, call options and other structured products. He also counsels and represents numerous domestic and offshore hedge funds, fund-of-funds, managed account platforms, commodity pools, family offices and investment managers on an ongoing basis. Robert has extensive experience in a broad range of corporate matters, including representing acquirers and target companies in public and private mergers and acquisitions; providing advice and counsel in corporate finance, bank finance and venture capital finance transactions; and representing clients in joint ventures, strategic alliances and general corporate and limited liability company matters. Robert is experienced in the structuring, negotiation and documentation of stock and asset acquisitions, mergers, leveraged buy-outs, split-ups, divestitures, private placements of debt and equity securities and secured financing transactions. Robert has lectured extensively on a variety of legal topics, including those relating to hedge fund lending, swaps and derivatives, hedge fund and fund-of-fund structuring, limited liability companies and legal opinions.